That’s probably the question all lovers of 2001: A SPACE ODYSSEY dread being asked because there’s no real way to answer that question. You ask a dozen people what 2001: A SPACE ODYSSEY is about and you’ll get a dozen different answers. When asked in interviews what the meaning of the movie was, Stanley Kubrick and Arthur C. Clarke refused to explain what anything in the movie is about, leaving it totally up to your interpretation. Ever since the movie opened way back in 1968 people have been arguing, discussing and debating the movie and nobody’s been able to come up with an explanation that satisfies everybody. It’s a movie that definitely couldn’t be made today, not for a generation raised on CGI mega-star power summer blockbusters as 2001: A SPACE ODYSSEY is, to be quite honest, slow moving. There are long stretches where we see nothing but huge spaceships moving slowly and majestically through space while classical music plays on the soundtrack. The scenes on the moonbase are acted so totally devoid of emotion that you honestly wonder if these are human beings or a race of androids that has supplanted humanity. Dr. Heywood Floyd (William Sylvester) is almost creepy in his dealings with other people, as he seems as if he’s forcing himself to smile or laugh or even hold a conversation for longer than thirty seconds. Later on the movie, a major character dies and the surviving character hardly seems to care. However, since he does have an insane computer trying to kill him, we can excuse him for having other things on his mind. 2001: A SPACE ODYSSEY starts at The Dawn of Man where apish humanoids battle to survive against wild animals, the elements and even each other. One tribe of humanoids wakes up one morning to discover an imposing black slab looming over them. Frightened at first, their contact with the slab seems to impart some intelligence to them, enough that they quickly use the knowledge to chase off the other tribes from a precious waterhole when they realize that bones make really great clubs. We are then transported to the 21st Century where Dr. Heywood Floyd is traveling to the moon where another black slab has been dug up. Although no one can figure out what the slab is they do know that it was deliberately buried and is roughly four million years old. It’s the first concrete evidence of extraterrestrial intelligence and the news is being kept from the folks back home. In fact, while he’s having a conversation with some Russian scientists, Dr. Floyd deliberately gives them the impression that the moonbase is quarantined because of a plague in order to protect the fact that The United States wants to keep the discovery of the slab for itself. This slab is sending out some sort of signal to Jupiter and eighteen months later, The Unites States sends a spaceship named The Discovery is sent to find out who is receiving the signal. That takes us to the third part of the movie where we meet David Bowman (Keir Dullea) Frank Poole (Gary Lockwood) and HAL 9000 (the voice of Douglas Rain) three members of the six-man crew. The others are in suspended animation until they reach their destination. Everything seems to be going as planned until HAL starts to make mistakes. And supposedly that’s impossible for a HAL 9000 to do. It isn’t long before it becomes apparent that HAL is murderously dangerous, operating on a deranged belief that Bowman and Poole are trying to sabotage the mission and the two human crewmembers find themselves struggling to stay alive, a struggle that Poole loses. However, Bowman manages to disable HAL and The Discovery reaches Jupiter where Bowman finds a third slab, this one enormous in size and he takes one of the shuttle pods into the slab, which acts as a Star Gate, transporting him to a new and different universe. There’s no point in discussing the performances in this movie because there really isn’t any as this is a movie where Stanley Kubrick is more interested in the ideas, concepts and technology than getting meaningful and distinctive acting from his cast. 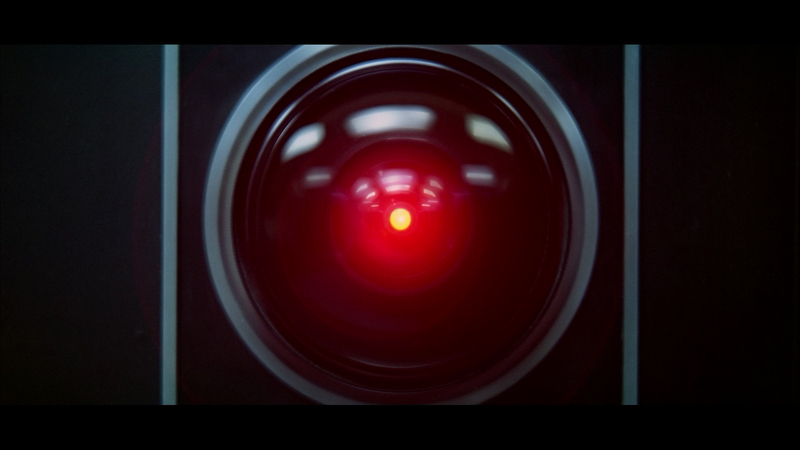 The most ‘human’ performance actually comes from the artificial intelligence, HAL 9000. There’s a scene that never fails to make me laugh out loud where Bowman and Poole take refuge inside a shuttle pod so that HAL can’t hear them as they’re discussing if they should deactivate him or not. There’s a shot from HAL’s point of view where his camera eye goes back and forth from Bowman’s lips to Poole’s and we suddenly realize that HAL can read lips. And later on when HAL is trying to talk a really pissed off Bowman out of shutting down his memory core, HAL’s calm, rational speech is another example of how brilliantly Stanley Kubrick could do the blackest of comedy. 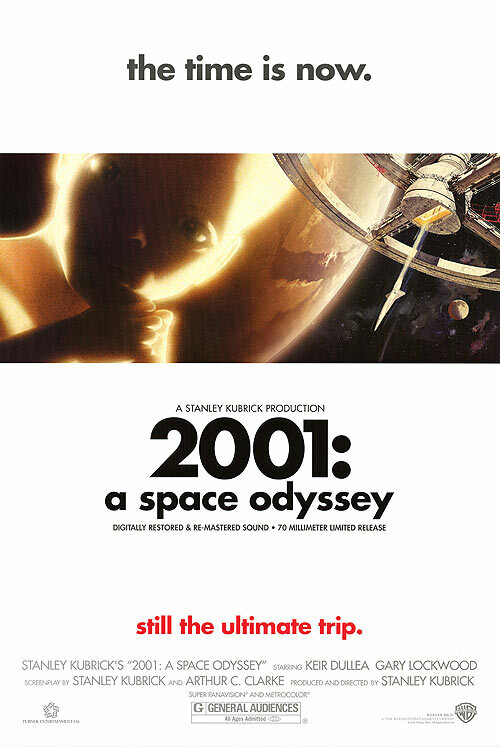 So should you see 2001: A SPACE ODYSSEY? I’d say yes if you’re a fan of science fiction films or Stanley Kubrick. 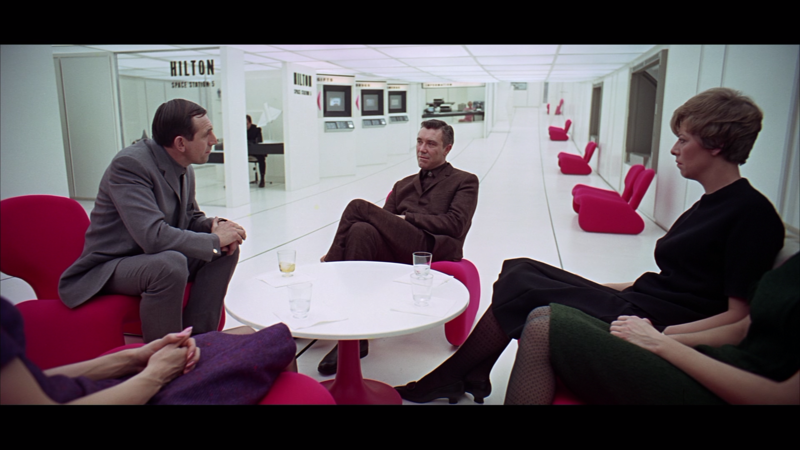 2001: A SPACE ODYSSEY is by no means a conventional science fiction movie and one that requires patience to watch, as it isn’t concerned with giving you a rollercoaster ride of thrills and excitement. It’s made to engage your intellect and spark your sense of wonder at the immensity of the universe and man’s place in it. It’s cinematic art at its finest and one of Stanley Kubrick’s best movies. Actually, I can sum up 2001’s plot in 6 words: “Humanity’s guidance by an alien intelligence.” The aliens, through their tools the Monoliths, teach early man how to use tools to kill animals for food and fight to protect themselves; they attract the attention of men on the Moon, then send a signal to Jupiter; they transport Bowman to an alien holding cell/zoo, then transform him into the Starchild to watch over Earth. The only thing that I’ve ever considered unusual about 2001’s story is HAL’s actions on the Discovery… there was no reason given for his sudden overreaction and desire to kill the astronauts. In fact, it was HAL who brought up “something being dug up on the Moon,” with the astronauts barely registering an interest in the subject. What did he have to overreact to? Maybe he was so badly reprogrammed before the start of the mission that he was defective out of the gate? The movie more so than the novel gives the implication that the Monolith is a force of evolution. That mankind learned to conquer fear through tools, and that the next stage of evolution will be found out there in space. The book actually explicitly explains that Bowman goes through the hyperspace gateway under the auspices of alien intelligences who are watching humanity. The hotel in the book is there to calm Bowman’s mind as they transform him into the Star Child. The Monolith itself is the proportionate unfolding of the squares of the first 3 integers. 1 by 4 by 9. That’s just for the first 3 dimensions, which the monolith continues into others. Good wikipedia article on it. But from an overall “but what does it represent?” level – this is an object that is not part of an organic program. It rests on the primitive landscape scanning early hominids and giving them thoughts which lead to their evolution. Therefore, this object represents man’s own mind superimposing order onto the random assortment of matter and life on planets and on the universe. It implies the idea, perhaps, that man’s mind is a catalyst for his own evolution.